double weave, 720 x 1280 mm. 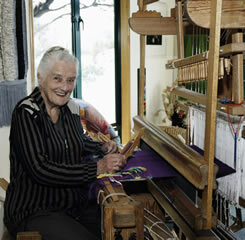 Peg Moorhouse working at her Oxaback 41 shaft draw system damask loom. Photo Dmitri Kotelevski courtesy New Zealand Encounters. Has exhibited in the last four Academy of Fine Arts Exhibitions in Wellington. 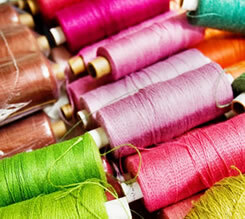 "On July 9th this year 2011 I will be 94 years young and still Designing and Weaving every day. In 2010 I was approached to have four exhibitions, first the Centre of Contemporary Art otherwise known as the prestigious COCA Gallery in Christchurch which gave me an exhibition where they showcased over thirty of my contemporary wall hangings. The Uxbridge Art Centre in Auckland included my work in one of their exhibitions, then Queenstown showed my work in their Silk Road Exhibition, where I won the major award. And finally in 2010 I had a pleasing exhibition at Creative Fibre in Nelson. A busy and successful year, I can tell you! This year 2011 I again put work in the Silk Road exhibition in Queenstown and again won an award, very encouraging. Next month I will be appearing in the Wild Tomato magazine, which is published in Nelson. In 2012, we the NZ Professional Weavers Network will be having another exhibition, its theme is "Flight" in all its phases. It is now May 2011, and I am weaving a series of much narrower hangings and in each one I am using a medley of lovely yarns that have come from all over the world!!" New Zealand weaver Peg Moorhouse's stunning original handwoven hangings and tableware look great in contemporary interiors. 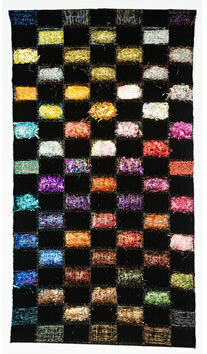 These eminently collectable large award winning wall hangings are suitable for both domestic and commercial interiors. Exquisitely coloured hand weavings are artworks inspired by the modern textured yarns Peg sources worldwide and by the colours of the Marlborough Sounds. Excellent as christening and wedding presents and retirement gifts. Weaving commissions are welcome. From her studio in New Zealand's Marlborough Sounds, renowned weaver Peg Moorhouse creates award winning damask table runners, napkins and wall hangings. Trained in damask weaving at the famous Saterglantan College of Handicrafts in Sweden, Peg has gone far beyond traditional damask techniques to create original and unique designs on the Oxaback 41 shaft draw system damask loom she imported to New Zealand from Sweden in 1992. 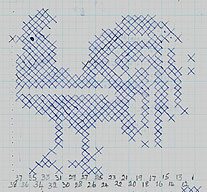 "Many looms are computerised today, but Peg still draws up her designs on graph paper and lines them up with threads to make her pieces"
Each collectable piece by award-winning professional fibre artist Peg Moorhouse is unique and represents days of precise and skilled handweaving. Twice highly commended and a ten time exhibitor at the prestigious World of Wearable Arts award, Peg's weaving is represented in private collections throughout New Zealand and Australia, US and Europe. In September 2009 Peg Moorhouse exhibited in the Queenstown Community Art Society’s Silk Road exhibition at the Cloakroom Gallery at their invitation and won the top award. 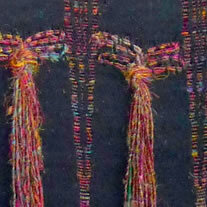 Exhibited two works in the Professional Weavers’ Network 2009 Exhibition shown in various centres in New Zealand.